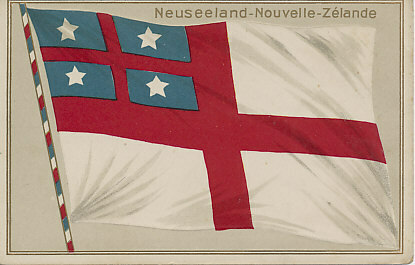 Embossed postcard of the flag of the United Tribes of New Zealand, the first flag of New Zealand, used until the signing of the Treaty of Waitangi in 1840. Logo: HGZ & Co. No. 11658. Dép. With troops from Australia, into the Australian and New Zealand Army Corps or ANZACs. Transported to Egypt where they defended the Suez Canal, ANZAC forces played a large role in the Gallipoli invasion, landing at Gaba Tepe - Anzac Cove. 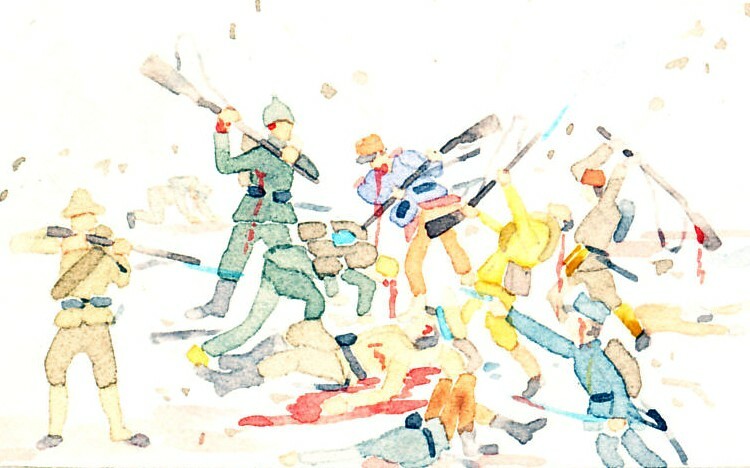 The ANZACs, clinging to cliffs beneath the Turkish defenders, suffered heavy losses. Keith Murdoch, an Australian journalist, played a large part in bringing the disaster to the attention of the British public and government. After the evacuation of Gallipoli, the ANZACs were deployed to Salonica, Palestine, and the Western Front. The New Zealand Division arrived in France in May, 1916, and deployed to the Somme sector. On September 14, 1916, launching an attack from Longueval, the New Zealand Division captured the village of Flers. New Zealand is a country.